All meetings are the second Saturday of the month. Notices at 1.30pm, you are welcome to bring lunch and rug from 12 noon. If there is a workshop, they often start at 12.30, but see below for details. February. Primitive spring flowers, inspiration for hooking, 12.30 start of workshop. March AGM. ( change from July). May. Making cocades and other flowers for rugs. 12.30 start of workshop. June. Lino and pizza box printing for rug inspiration. 12.30 workshop start. July. Marie Curie tea party and sit and mat. August, no meeting at museum. Summer picnic. The January 2019 page has some tips for new proddy rug makers to help get you started. Welcome to our web pages. The West Riding Ruggers have been meeting for over 21 years. As well as Chairing the Group since Autumn 2006 I also write and edit the web page each month. 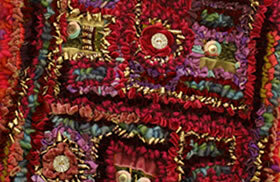 Our group aims to both preserve and promote hand rug making. We use a variety of techniques including hooking and proddy, latch and locker hooking, knitting and crochet. We are a lively group with a few new members each month, and welcome new members. We are not a substitute for a days workshop, more a group of like minded individuals who like to share good practise and work together to develop our skills. Our meetings are a mixture of talks, short workshops, “sit and mat” and community projects, as well as a Show and Tell each month when Members share their completed rugs with the rest of the group. It is the photos from the Show and Tell sessions that appear on the monthly web pages. If you are interested in joining us please browse some of the meeting pages to get a flavour of our work. They are now organised so that you can scroll down through a whole years archive on one page. A new venture for us is to put on our web page our meeting programme. So please look and see what we have planned for the next few months on our membership page. (Sometimes the scheduled event may need to be cancelled or rearranged due to ill health and we can take no responsibility for this occuring) and we also try and retain a certain amount of flexibility so that we can respond to new interests/ events. 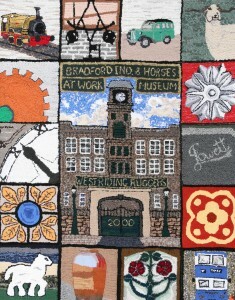 We also often contribute to a group project, for example the panel which celebrates the Bradford Industrial museum below, or the Queens Jubilee Bunting. We ask that members have an input into these projects, according to their skill levels. If you are interested in joining us, it is a good idea to email us first via our contacts page please, so that we can tell you an appropriate meeting to attend.